Developer Quelle Histoire is famous for their historical apps. One of theirs we reviewed was Odysseus for Kids, a beautiful storybook that recounts the famous Greek epic. Filled with mini games and maps, it is a great tool to get kids interested in learning history. Today, we have a new app of theirs. 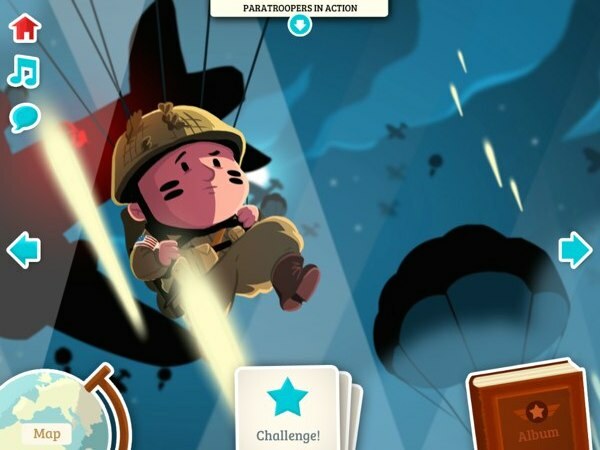 Called D-Day for Kids, it aims to introduce kids to the historical Normandy landings in June 1944. 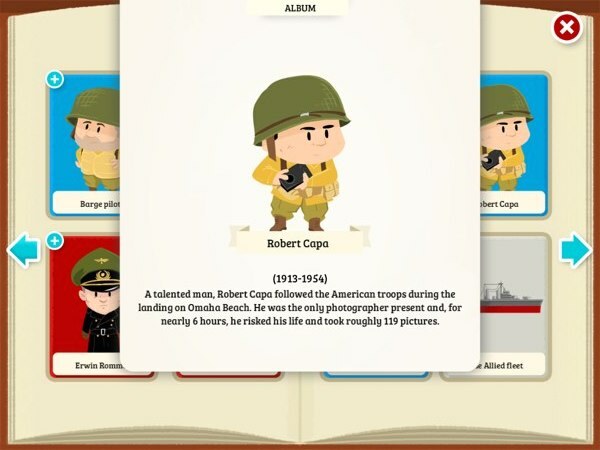 Like Odysseus for Kids, the new app utilizes graphical storybooks to convey important facts. D-Day for Kids tells the story of the historical Normandy landings in June 1944. The apps open with some background on how World War II started: England and France declared war on Germany, who invaded Poland. The German army then attacked their former ally, the Soviet Union, and the Japanese bombed the American port of Pearl Harbor. The latter incident provoked the USA to enter the war, and the Soviets to ask the Americans to open up a second front to the West while they fought in the East. These events set up the rest of the book. Kids will learn about the extensive Atlantic Wall which was built by the German army to stop the Allies from coming into Europe. Kids will also learn how the Americans, English, Canadians, Australians, and New Zealanders planned a mission, codenamed Operation Overlord, that involve a total of 3 million men. The story then continues with the planning for the Normandy landings on the Norman beaches of Cotentin. The Resistance movement sabotaged the railways and bridges the night before the paratroopers were dropped, but 5,000 boats and air bombers managed to attack the beaches at 5.45 AM on Jun 6, 1944. The book provides a good amount of information of the Normandy landings. Each page features a detailed map to help kids visualize the environment where the event took place. 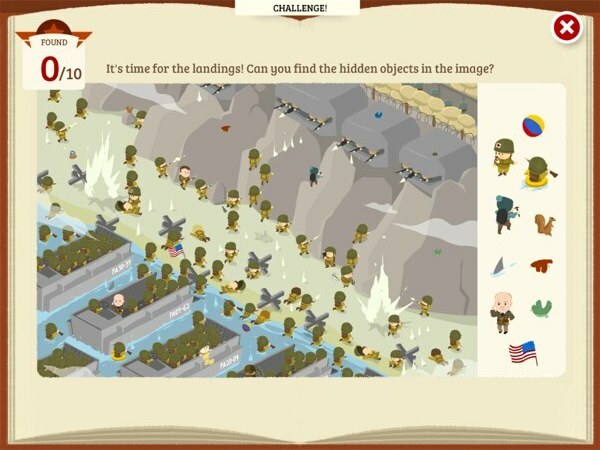 The scenes in the app are accompanied by a WWII-themed mini game, many of which were adapted from popular games such as jigsaw puzzles, spot-the-differences, hidden objects, and memory match. But, there are also several unique ones, such as tracing lines to find matching dynamite detonators. The app uses professional narration to help kids ages 7+ to understand most of the storyline. But, they may still need your companion to get a better context for the events. The book is also available in French and German. D-Day for Kids includes 10 WWII-themed mini games with popular mechanics, such as memory matching and hidden objects. D-Day for Kids includes several quizzes to test the reader’s comprehension. For example, kids are asked to match historical figures such as Stalin and Churchill, to their respective countries. In another game, kids are asked to put the event illustrations in the order of their occurrence. Upon completing the mini games, kids will get stickers depicting the figures, objects, and key symbols in the story. Each sticker also comes with some interesting facts. For example, kids can learn about Robert Capa, an American photographer who joined the troops in Normandy landings to take pictures of the historical moments. D-Day for Kids is filled with detailed information, even in the reward stickers book. D-Day for Kids is a great way for kids ages 6+ to learn the history behind the Normandy landings. Filled with interactive features, the app makes reading historical facts interesting. If you love history, or if you’re just looking for a great tool to supplement your kids’ learning at school, you’re going to love this app.